When we were in Kenya-Tanzania in February, our Tauck World Discovery tour director, Deanne Inman, gave us an airmail note-letter. With this, we were to write ourselves a letter about our safari we had just completed. Then she would mail it to us 3 weeks after we returned home and we were back into our normal daily hustle and bustle. So, following is the letter I wrote. 1. I remember going back to the hotel, the Fairmont Mara Safari Club, from the Tauck World Discovery Farewell Cocktail Party in the bush, and the only thing on the road was 5 elephants. 2. I remember having to check the back tire of our safari vehicle (I had to go to the WC behind the van because no restrooms were nearby) in Ngorongoro Crater in Tanzania, and therefore, causing our van to have to separate from the other 2 Tauck safari vehicles. This made us a little late, causing only our safari vehicle occupants to see a rare cheetah. 4. I remember Victoria Vance of Manhattan walking to her seat carrying her plate of food at our bush luncheon in Ngorongoro Crater in Tanzania. All of a sudden, a black-shouldered Kite (bird) swooped down from the tree above and stole her juicy steak from her plate. She hollered “He hit me, He took it,” and she didn’t even drop her plate. 5. 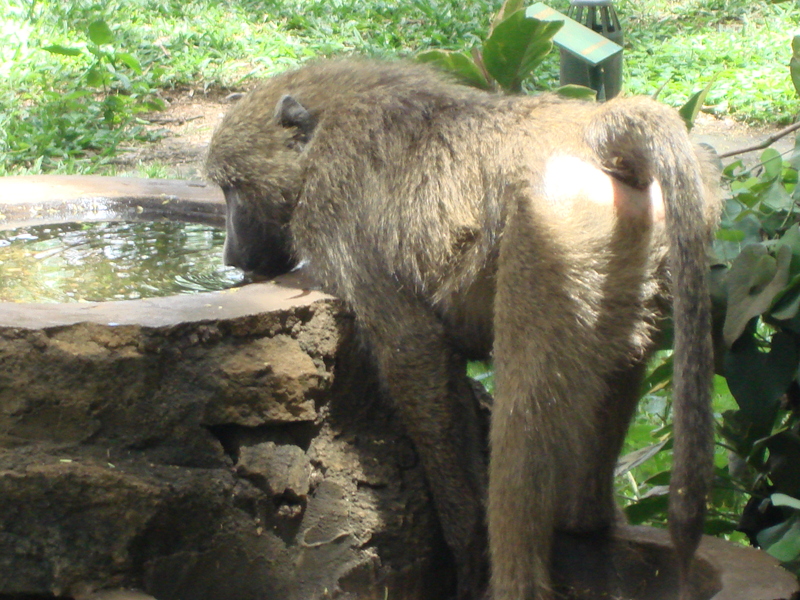 I remember in Samburu, Kenya, a Vervet Monkey stealing the English Bread that Blase had on his plate as he was eating Breakfast. That monkey was watching Blase from afar and then suddenly jumped through the open window behind Blase, jumped on the table, and stole his bread and took off, all in an instant. 6. I remember a beautiful, gorgeous adult leopard resting in a tree, only to learn she was sitting on food she had caught earlier. 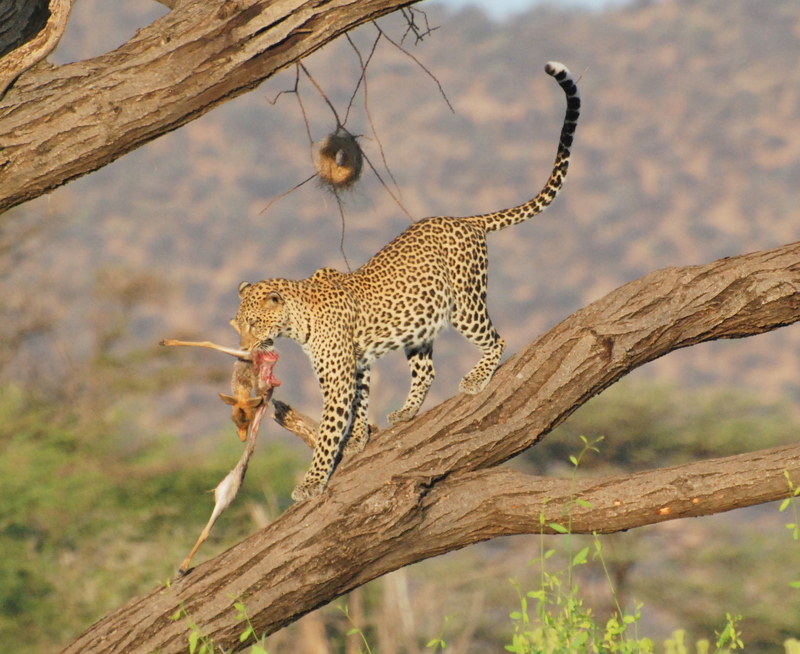 And then the leopard got up, carried the food in its mouth and left the tree. 7. I remember 4 hyenas eating the stinky carcass of and elephant or buffalo, in the Maasai Mara in Kenya, and seeing 3 other hyenas who had eaten or were ready to eat, waiting nearby. Also nearby were 2 male lions who probably were involved in the kill, lying nearby, and one had an injured eye. 8. I remember watching a Herron eat a snake that was yellow on one side. The Herron played with the snake and then ate it, inch by inch. I was watching my first kill in the wild on an African Safari. 9. I remember Tom, with his huge telephoto lens camera, and several others on the safari, clicking dozens of photos per second, when a Top 5 animal appeared every time. 1. I remember the weather being perfect with no rain and everything green, green, and green except Samburu, Kenya which was desert-like. 2. I remember the elephant in Tarangire National Park in Tanzania coming up to our safari vehicle and smelling us with her trunk. 3. 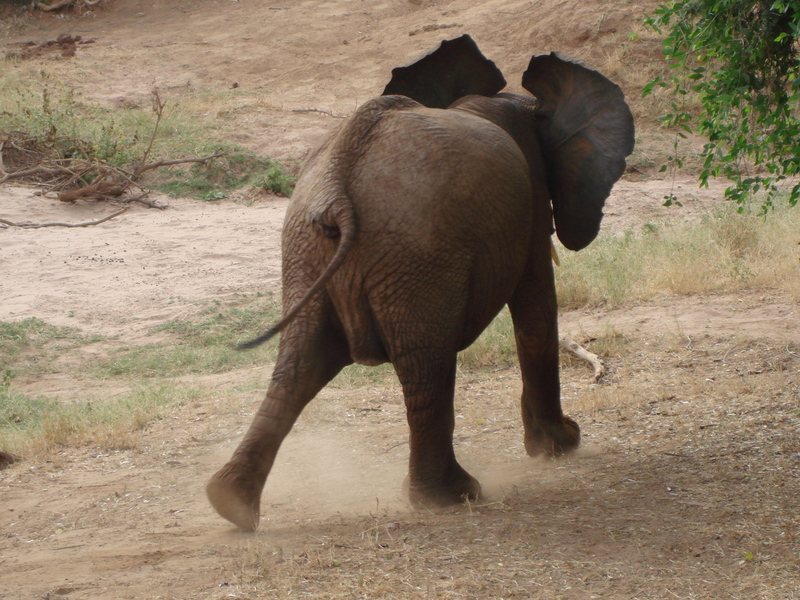 I remember the 6-7 year old male elephant in Samburu, Kenya, charging, threatening, stomping, and bluffing us in our safari vehicle, trying to get us to leave. 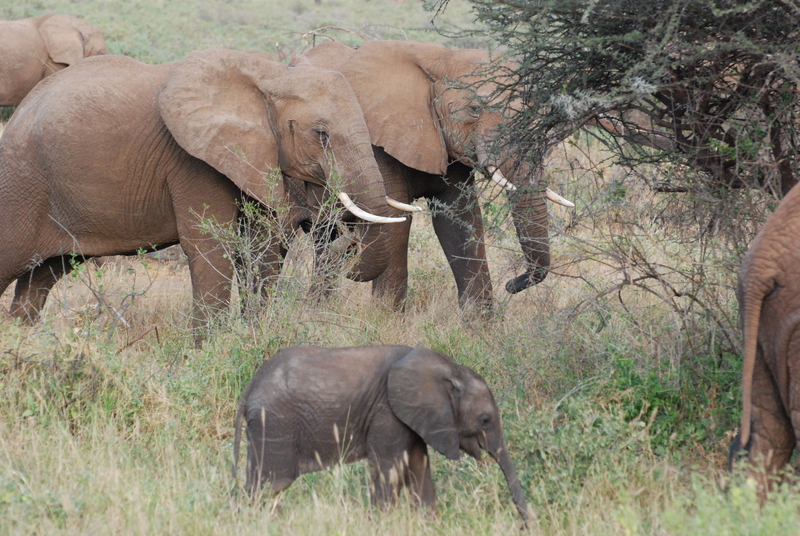 And all the while, our safari driver telling us he was just a teenager learning how to be a big bull elephant one day. 4. I remember in Samburu, Kenya, telling Carolyn to turn around and she said “Why”? And I said “Look”. 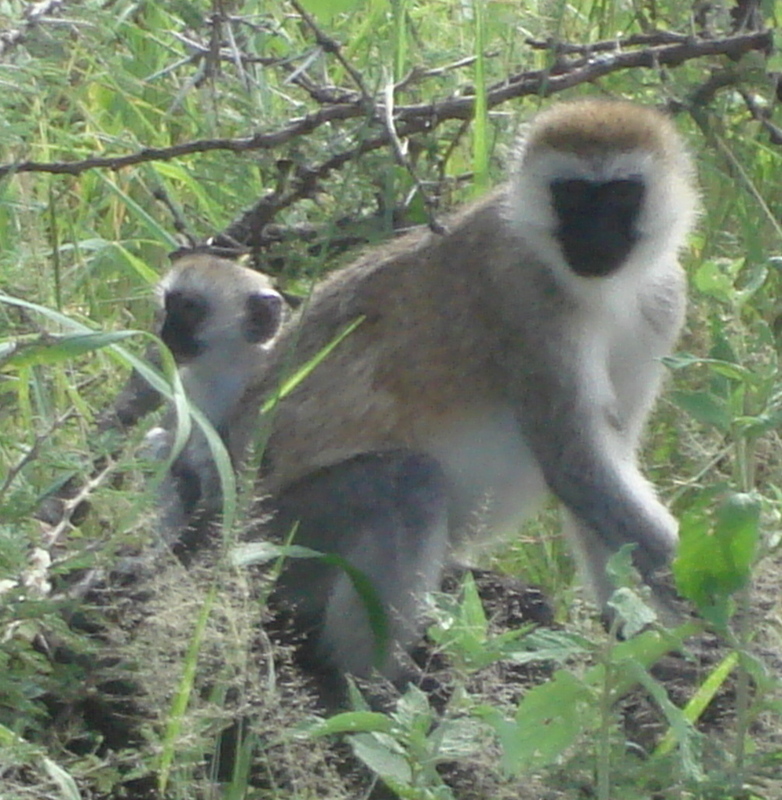 She turned around, saw the Baboons right by her and screamed and jumped with surprise. 5. I remember in the Serengeti, seeing 2 hippos in a pond, playing, biting, and fighting each other with their mouths open, showing all those huge teeth. 6. 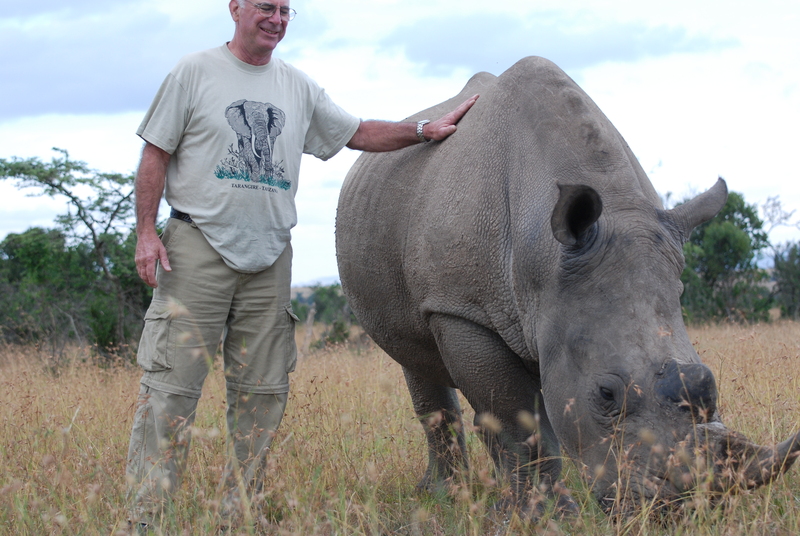 I remember in Sweetwater, Kenya, being told by the armed Park Rangers to come and pet the White Rhino, Max. I did right away but Carolyn was scared and, finally, we both had our photo made with him. 7. I remember spotting the male white rhino on the way to the Tauck World Discovery Farewell Cocktail Party BEFORE our safari driver spotted it. 8. 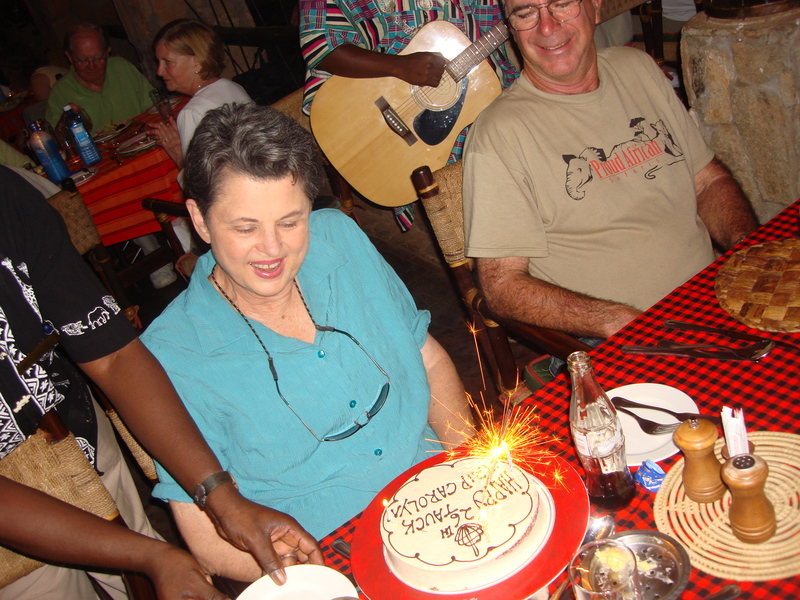 I remember Carolyn getting a Surprise 25th Tauck Tour cake in Samburu, Kenya, complete with sparkler and the hotel waiters with instruments to accompany her 26th tour send off and many more. 9. I remember that an African Safari in the wild is the No. 1 most awesome experience in the world and that I promise to be on another African Safari every 2 years with Tauck World Discovery.